← A small donor-family versus the might (and nonchalance) of Singapore National Heritage Board? So I was lucky enough to go on a bit of a scenic lunch; Labrador Park. It’s tucked away at the end of a small road, so it’s peaceful and scenic. It’s also one of the historic places that National Heritage Board has ear-marked for informative trails. The park was the site of large rocks (Dragon’s Teeth?) marked on seafarers’ maps for centuries, and it was also the site of some WW2 guns. 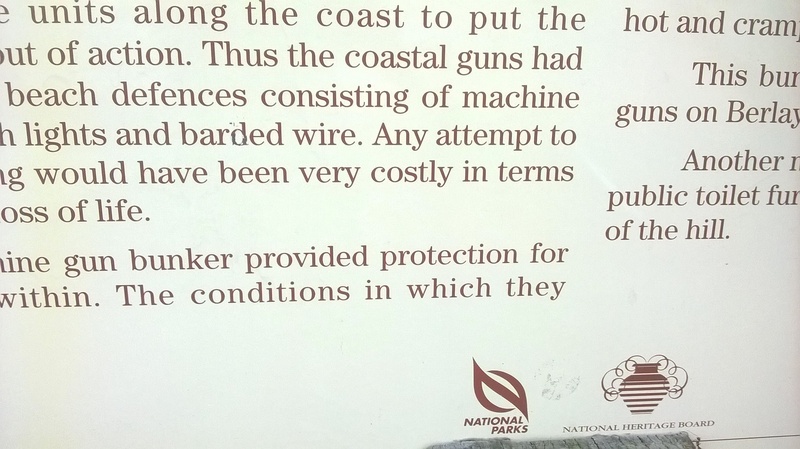 So there are some NHB/National Parks Board panels to inform visitors of the park’s significance. Well, I was happily reading them, until I spotted a funny little mistake. Can you see it in the photo below? “…barded wire.”, it says. I assume it is ‘barbed wire’, and not some poetry-inclined wire that has a particular bard-like disposition. Small mistake, yes, but consider how many people had read the text prior to its production/installation (at least half-a-dozen?? ), then the mistake is unforgivable. But the sloppy ‘final approval’ process does not end there. In the same panel is also a ‘spacing’ issue right at the end. 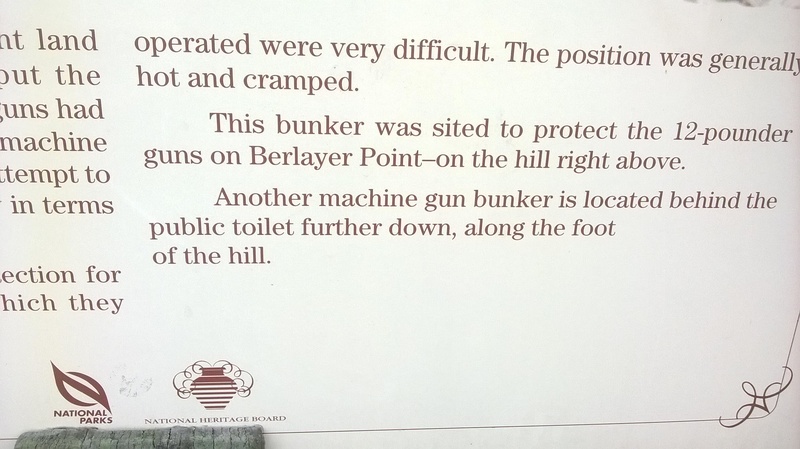 The parts-of-the-same-sentence “…along the foot” and “…of the hill” should have the gap closed. Again, a small error missed by the producers. Yes, I am being petty. Small, honest errors that shouldn’t be overblown, right? But no. Consider that many salaried-people had seen, and approved, of the text, and also overseen the process from scratch to completion. And NONE of them caught the errors… Also, when was the last time ANY NParks or NHB staff had read the panel after it was installed? Public money was spent on this installation (and also the employing of copywriters/researchers), and now, even more money will have to be spent to change it simply because in the first place, someone didn’t do the job s/he was paid to do. Not in the nasty spirit of the complaint made by a member of the public (to the much-read Straits Times, no less) about the errors at the new archaeology exhibition at National Museum of Singapore (which embarrassed the institution), I suppose the readers of my small, humble blog who are in a capacity to rectify the errors would have a few weeks to sort this out, before someone writes to the press again? P.S. In my last blog on a similar error on a Gan Eng Seng marker (click here, where the school principal was referred to as ‘principle’) in Nov 2012, I am glad to note that the text was replaced after a few weeks. PPS I was back in Labrador Park last week (2 Jan 2015), and no change has been made to the ‘barded’ wires. I suppose maybe it is a real word? There’s an archaeology exhibition at the National Museum? Thanks! I’ll go check it out.